So you’ve thought of a domain, and it’s the perfect domain. It’s catchy and people are going to remember it like their favorite movie quote. I hate to say it, but don’t celebrate yet. The next step is to check if it’s available through a site like godaddy.com. If you’re lucky, it’s yours for the taking and ready for you to claim it. If you’re like roughly 99% of the rest of us, your dream domain (the one that people are going to remember like their own phone number), has already been snatched by someone else. Cue some tears and a giant bag of your favorite M&Ms. Although, it is possible that the owner will sell it to you, but that often comes at a price of thousands of dollars. If you don’t have that chunk of cash lying around, I have a few ideas to help you secure your perfect domain. Before we start brainstorming, let’s chat about a few keys to a great domain. We want to make it as easy as possible for people to find you online. If they can’t remember your domain or can’t get it right, they may just give up on trying to find you. If you’re able to get your business name or a shorter version or variation on your business name, perfect. Don’t use slang or alternate spellings for words, because that can just create confusion. The shorter, the better when it comes to domains. Shorter often means easier to remember, and easier to fit on a business card or other brand collateral. If your domain is available on all the social channels you plan to use, this is a major bonus. Go ahead and create your social accounts with that handle as soon as you’ve purchased your domain, whether you plan to use that account right away or not. If your domain isn’t available using the .com extension, you can consider other options like .co, .org, .net, .us, and the list goes on. Those are the most common in the U.S. I would recommend .co as a second option to look at or .org if you are a non-profit or a company with philanthropic or benevolent vibes. If you include Co. in your business name, that’s an easy go-to for your domain. For example Dwell Dinner & Co. uses dwelldinner.co. A clever solution for selecting an extension is to pick one that works with your page URLs as a whole. Let me explain. A good example of this is the website for designer, Jessica Hische. Her domain is jessicahische.is. So when you go to one of the pages on her website, it looks like this: jessicahische.is/heretohelp. Clever, right? There are a ton of other extensions available, many of them new and not mainstream yet. For example, you could choose .life, .store, .club, .xyz, .today. If you do choose an unconventional extension, I’d suggest always pairing it with a computer, pointer, or web icon on your brand materials to indicate it’s a URL. Another solution that can work really well is to add an action verb before the company like ‘shop’ , ‘explore’, or ‘join’. Some examples are www.getpocket.com or www.useloom.com. By the way, I love and use both of these tools. Be sure to check them out. Fitting since your website is your online headquarters. Is your website or company app based? Add ‘app’ at the end of the domain. If your brand/business is location-specific, use your state or city as a location identifier. This is often one of the easiest solutions. Do you have a short tagline that you love and are going to hold on to for a very long time? That might make a great brand-oriented domain. If you use an abbreviation in your business name, spell out in your domain. For example, ‘co.’ could be spelled out as company, at least for your domain. I don’t think dashes in domains are the worst thing ever, but I would say to avoid it if at all possible. I’m speaking from experience on this one. I had a dashed domain and I don’t think it was a great solution. It ultimately led to a domain that was confusing for people and hard for them to remember. Where exactly is the dash supposed to go? Couple that with using .co at the end, and it was too much. I ultimately switched to what I’m using now which is www.anchoradesign.com. Not only is it much simpler, but it matches all my social handles. I’ve ironically also had the experience recently of trying to find two different companies’ websites, missing the dash, and then having to google them to find their URL. If you use a number in your domain, be prepared to clarify every time you say your domain if it’s the number as a numeral, or spelled out. Next time you’re looking for a domain, I hope you get the one you want. But if not, I hope these tips help you find that *next* perfect domain. Were you lucky enough to get your dream domain? If not, how’d you make it work? 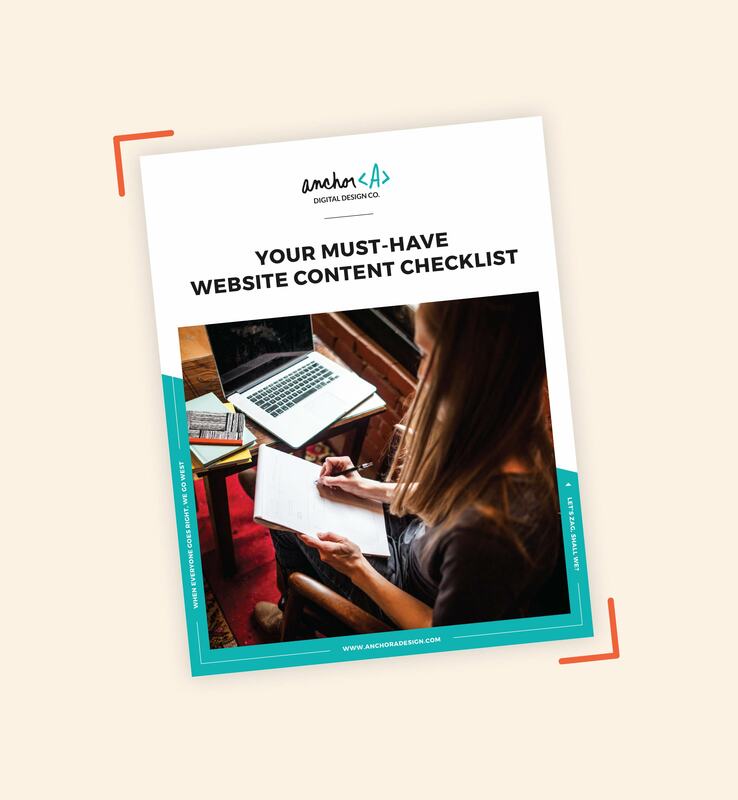 Get a jump-start on planning your website!